Ladies and Gentlemen,At the outset, let me thank the Energy Institute for the invitation to speak at this year’s International Petroleum Week and discuss our global pathway towards a better energy system. This is a crucial discussion and many of the leaders who can improve our energy system are here today, so I very much appreciate this opportunity to join you.Friends, before I speak about the future of energy, I would like to take a moment to reflect on the past. Specifically, I think that two truths from the past must set the context for how we grow and develop our energy system from this point forward.First, we must recognize the role of oil and gas in the global development arc that defines modern life. Visionary leadership by this industry – innovators, entrepreneurs, scientists and engineers – formed the foundation for society as we know it, improving almost every part of our daily lives. It is impossible to look at the development gains made to date without acknowledging the proliferation of affordable, reliable energy. Second, we must also acknowledge that we live in a vastly different world now than we did when we discovered the potential of fossil fuels. We have more people. We have a more connected world. We have rapid development in all parts of the globe. We have a degraded natural environment that must sustain more and more people every minute. And we have new scientific understanding that demonstrates that the risk-reward dynamic of using fossil energy has changed dramatically. The previous risks associated with climate change were for the most part regulatory, but that has shifted to more material risks. As the science has gotten clearer regarding the impacts of climate change, we are also starting to see those impacts materialize. Droughts, floods, high heat, extreme weather and rising seas are displacing people, incurring infrastructure costs and putting lives and livelihoods in jeopardy. And no one is immune from these risks. Climate change is no longer a theoretical risk to infrastructure, it is a real risk and even oil and gas infrastructure will need to be made more resilient. Risk has gone from theory to material manifestation. And one of the most interesting discussions at the World Economic Forum was about the great need to disclose this risk so shareholders are aware of their portfolio’s exposure. So at this point, with a dramatically different risk dynamic surrounding all development and energy in particular, we must have an inclusive conversation on how to proceed in ways that are good for all people and for the planet we all share. This conversation must include the voices of the energy leaders who have brought us to this point and will continue to play an important role moving forward, which is precisely why I am here today. I am here to further engage the oil and gas industry and foster a productive dialogue as implementation of the Paris Agreement begins in earnest. I believe that today’s energy leaders can and must be part of the discussion as the world transitions to a new energy mix that sustains peace and prosperity as our population swells from 7 to 9 or 10 billon people, or more. To balance our human need for affordable energy with the increasingly clear scientific evidence that unmanaged fossil fuel use is incompatible with a stable climate and the security that such stability brings, we must act quickly, collaboratively and in a concerted manor to update the global growth and development model. Fortunately, we do not have to wonder what such a transformation looks like. We are not starting from scratch. In 2015, governments of the world adopted the Sustainable Development Goals and the Paris Climate Change Agreement. 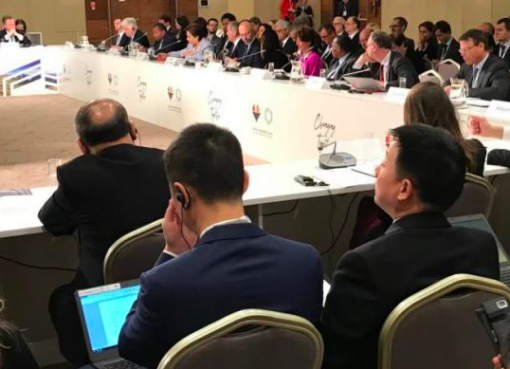 The Paris Agreement unites all nations in a common goal – to achieve climate neutrality in the second half of the century by taking steps to limit global average temperature rise to as close to 1.5 degrees Celsius as possible. This complements the 17 aspirational Sustainable Development Goals, or SDGs, which are designed to ensure human needs are met, economic opportunity is open to all and the natural world we rely on is protected. Climate change is also one of the SDGs. These agreements were put in place with widespread support from cities and regions serving hundreds of millions of people and businesses and investors worth trillions of dollars. National governments are not alone in this new development direction, it is a trend supported by business, finance and governments at all levels, as well as the public. 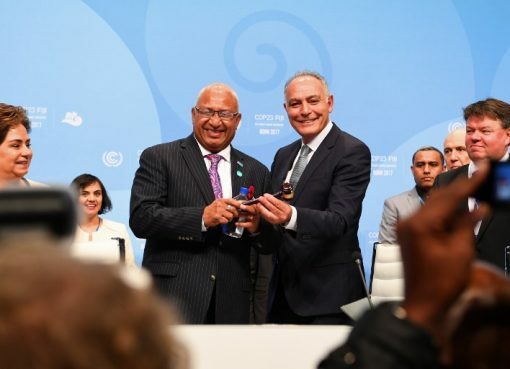 Rapid entry into force of the Paris Agreement last November and recent work towards the Sustainable Development Goals shows that momentum towards this globally agreed vision has not diminished as implementation gets underway. And as we move into this next phase for global cooperation on climate change, I see three things that the oil and gas industry can do to be active in the transition to more socially and environmentally responsible development. First, begin with the benefits. Aligning with the Paris Agreement provides benefits that go beyond short-term profit and loss. From simply gaining operational efficiency to better management of risk and reputation, incentives are already emerging as countries implement their contributions to these agreements. To capture these emerging benefits and grow the global market, companies need to start looking beyond the next quarter’s bottom line. Which takes me to my second point – look at the long term. A diverse business plan that aligns with global goals is in the energy industry’s best interest. It is also in your best interest to limit sea-level rise, reduce extreme and unpredictable weather, increase stability in the developing world and grow global wealth at all levels of society. These are goals we are all working towards, even if your long-term action plans are not as specific as the Paris Agreement and SDGs. My third and final point is – invest in innovation. This industry has done quite well by innovating to serve the world’s energy needs. And yet, it is only a fraction of what is possible as billions of people are born and opportunity opens even further. Investment in innovation leverages your history to serve the next generation and then one after that, without impacting human or planetary health. Whether its carbon capture and storage or clean energy or research and development in biofuels and other green technology, every incremental step towards a new, low-emission development model further decouples emissions from growth. This is a crucial part of the transformation to a truly sustainable, climate-safe society. Now, I know that many of you are already leading in these areas. Norway’s Statoil is working on CCS. Saudi Aramco is diversifying into solar and other renewable energies. Many large oil and gas companies are internally pricing carbon, collaborating to reduce emissions from operations or setting up funds to accelerate this transition. The International Energy Agency has identified minimizing methane emissions from upstream oil and gas production as one of five key global greenhouse gas mitigation opportunities. Low-cost reductions in this area could account for nearly 15% of total greenhouse gas reductions needed by 2020 to keep the world on a 2-degree path. I applaud the companies working to reduce these emissions as part of the UNEP-hosted Climate and Clean Air Coalition and its Oil and Gas Methane Partnership. But I also must ask – why is this not in the DNA of all companies in the industry? You are making progress, but like so many other industries who are taking note of our new direction, there is more to be done. Today, I ask you all to do more. Make this an industry-wide movement. In conclusion, let me say that I very much want the energy industry, which has done so much for the common good of humanity to this point, to be part of the constructive conversation about how to get to true sustainability. Because while we have witnessed the start of the changes to our risk dynamic, the generations to come will feel the full effect of this changing risk dynamic. Now, just how much that dynamic changes, well that is up to us. I am very glad to be here at Petroleum Week and I thank you very much.